At first blush, the Ergopod seems pretty innovative. It's a workstation that allows you to do your computing in positions that are far more comfortable for your body than sitting upright in front of a desk. Instead, you can use a reclining chair, or even your bed. 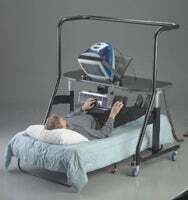 The Ergopod also includes a power strip, motorized legs, a motorized monitor platform, and a keypad for controlling it. Also, it's great for people who like to pretend that their desk is a spaceship. I'm naming no names here. But on second look, the Ergopod starts to look more like some sort of medieval torture device updated to the 21st century. I mean, what happens when the straps connecting that computer to the pod snap ? Ever had an iMac in the face? It ain't pretty, let me tell you. And those of us who work from home hardly need another excuse not to leave bed, anyway.